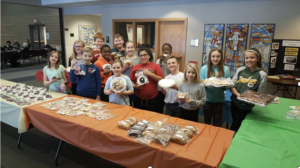 On February 4, our 5th and 6th grade Bake Sale raised $950. These funds will be sent to Lutheran World Relief (LWR) to help feed those in need by helping purchase chicks, baby pigs and other farm animals for families in need! We will continue collecting funds to help feed others because we are called to care for our neighbors. You can donate directly to LWR or by sending funds to St. John’s. Here is the website for more information community.elca.org/elcagoodgifts.